Metro officials say track conditions were not a contributing factor in the fire on an unoccupied Red Line train Tuesday evening. According to a preliminary investigation, it's possible the train's metal-shielded hoses came into contact with power cables under the car's body, creating an electrical short. The train in question is a part of the 1000-series, the oldest in Metro's fleet. The new 7000-series rail cars will replace the 1000-series next year. A definitive cause has not been determined. Officials say their investigation will take several days to complete. Trains resumed normal service Wednesday morning. The fire led to the suspension of service between Takoma and Forest Glen during rush hour Tuesday evening. The investigation continues into a fire on a Metro train on Tuesday. 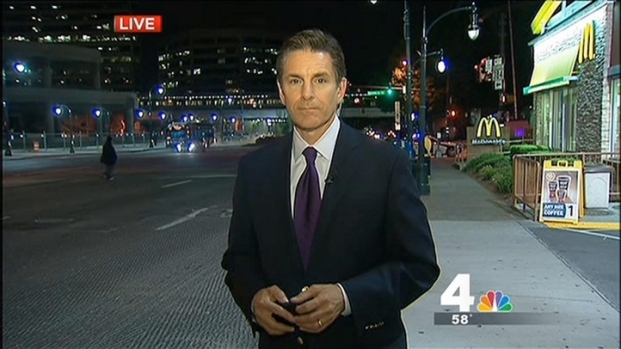 News4's Jim Rosenfield and Shomari Stone report. The flames, visible on security camera footage from the Silver Spring transit center and on passengers' cell phone video, frightened passengers and led to a commuting nightmare for Tuesday afternoon's rush hour. The passengers on the train were evacuated at Takoma Park station, before the flames were visible. But some witnesses nearby reported that they heard three loud booms from the train. "Very loud," said witness Dorsey Evans. "And then all of a sudden I saw the flames coming from underneath the Metro car." Service between Takoma and Forest Glen was restored by 7:30 p.m. Tuesday, but access to the Silver Spring station was limited, with passengers allowed only to exit at the station, for almost two more hours. By 9:20 p.m., two-track service between Takoma and Forest Glen was restored, and riders could again enter the system at the Silver Spring station. Traffic around the station also was affected due to the response from Montgomery County Fire. Colesville Road was blocked. "You never know what you can expect with the Red Line," one passenger said. "Not entirely happy with Metro," said passenger Sean Griffin. "I got charged for the experience of not getting where I was going, so that did not make me happy." Montgomery County Assistant Fire Chief Scott Graham said collector shoes have been known to catch fire. The fire did not spread inside any railcars, and firefighters extinguished the fire with a dry chemical, Graham said. Metro officials did not tell News4 how often fires happen on trains, tracks or in stations. But News4 has reported on at least 10 incidents of smoke or fire on Metro trains or tracks, reported Shomari Stone. "I would say incidents like tonight's are extremely rare," said Caroline Lukas, of Metro. "I do know it was one of our oldest cars that was involved in the situation this evening."